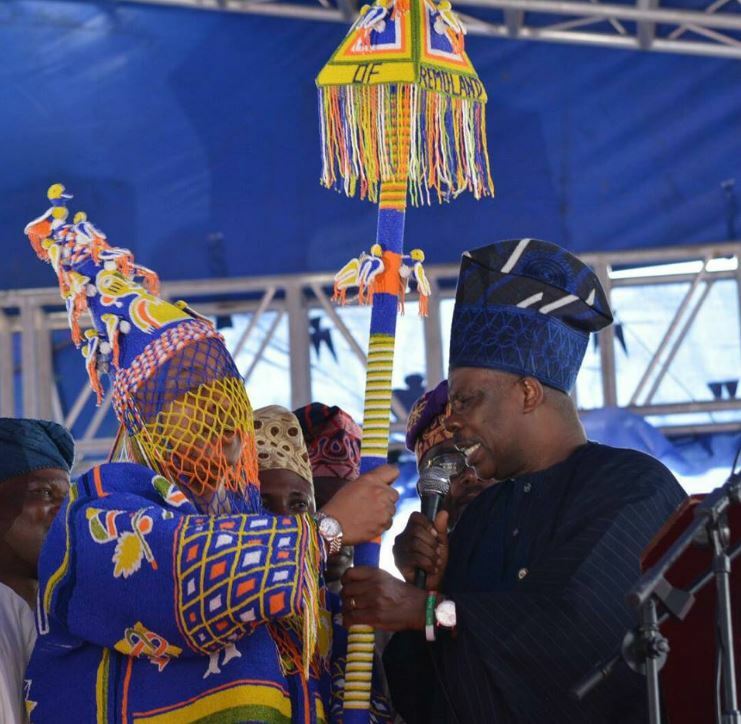 The Vice-President, Prof. Yemi Osinbajo and the Ogun State Governor, Ibikunle Amosun, has advised the new Akarigbo of Remoland, Oba Adewale Babatunde Ajayi, to use his stool and rich professional background in law and accountancy to galvanise his subjects for the development of Remo. Both of them spoke on Thursday at the installation and presentation of staff of office to the new monarch at the Gateway International Stadium, Sagamu, Ogun State. Oba Ajayi is the 19th Akarigbo of Remoland. Osinbajo, who described the installation of the Akarigbo “as a monumental historical event,” urged him to use his reign to usher in a new lease of life for his people by bringing together the sons and daughters of Remoland for the progress of the town. Describing the Akarigbo throne as an hallmark of enterprise and integrity, the Vice-President added that Oba Ajayi should use his professional acumen to organise his subjects for unity and progress. He said, “We are all witnesses to this monumental historical event. The throne of Akarigbo has long been a representation of enterprise and integrity. Therefore, the new Akarigbo must combine his discipline as an accomplished accountant and solicitor of the Supreme Court of Nigeria, to rally the people of Remo in unity, for the development of the land. 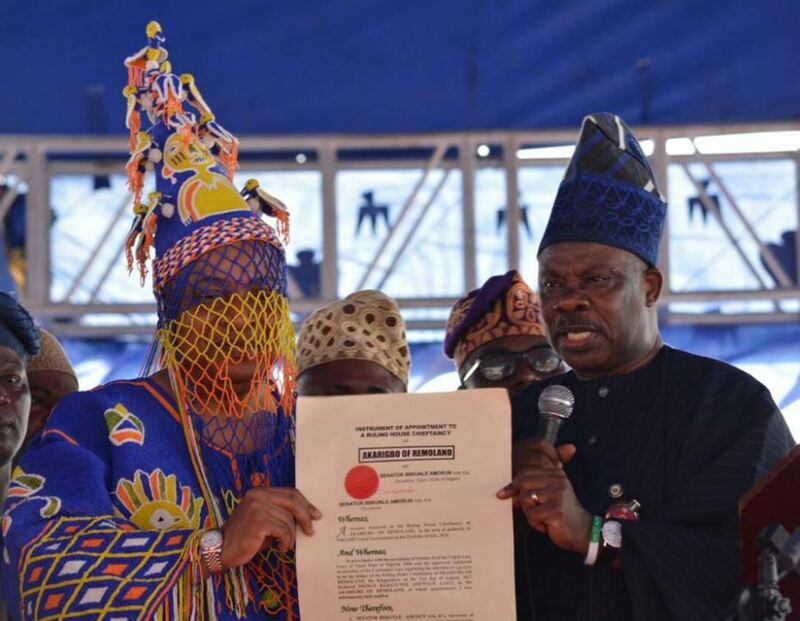 On his own part, Amosun urged the new monarch to promote peaceful co-existence among the residents of Remoland. Amosun, who described the process of the monarch’s selection as rancour-free, commended others who vied for the stool for their show of sportsmanship. He appealed to the people of Remoland to support and cooperate with the monarch in order to surpass the achievements of the late Akarigbo. Giving the peculiar location of Sagamu, the governor implored the new monarch to collaborate with security agencies in checking the influx of migrants with criminal tendencies from other parts of the country. Responding, Oba Ajayi called on the people of Remoland to cooperate with him and the state government so they could cater to the needs of the unemployed youths. He also called on other royal fathers in the state to continue to play their role as a crucial stabilising factor in their communities. He said, “But to attain that glorious future, we have to work together as one large family. The government cannot do it alone. We have to complement the efforts of the government. “We have to assist the government to cater to the needs of our growing number of unemployed youths. We have to carry our women along, those born entrepreneurs who have to juggle the challenges of the domestic front with today’s current realities of dwindling resources. 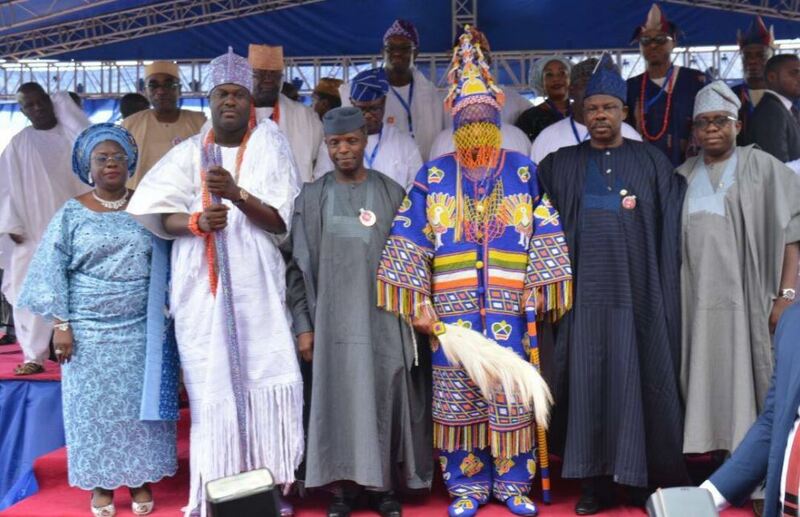 The Ooni of Ife, Oba Adeyeye Ogunwusi and the Alake of Egbaland, Oba Adedotun Aremu Gbadebo, who also spoke at the event, congratulated the monarch and called on his subjects to support him. Ooni also prayed for peace and tranquility in Remoland during Oba Ajayi’s reign. He prayed for the peace and progress for Remoland. Other dignitaries at the event included the Oba of Lagos, Rilwan Akiolu, Osile Oke Ona, Oba Adedapo Tejuoso, the Speaker, Ogun State House of Assembly, Suraj Adekunbi, Deputy Governor, Ogun State, Mrs. Yetunde Onanuga and Chief of Staff to the Governor, Chief Tolu Odebiyi.